Blame doesn’t really solve anything. Yet most of us seem content to blame rather than solve. 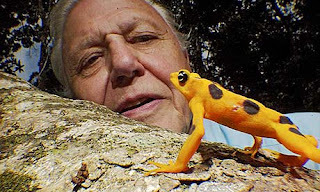 When David Attenborough was asked by Charles Woolley, during last Sunday’s “60 Minutes” interview, why he didn’t believe there was a God, Mr. Attenborough didn’t give a reason, rather, he raised an objection. (There is a world of difference in proving that something does not exist, and, objecting to its existence!) His objection was to blame God for human suffering. He said, “I always reply by saying that I think of a little child in east Africa with a worm burrowing through his eyeball. The worm cannot live in any other way, except by burrowing through eyeballs.” How could there be a good all-powerful God who would create such a barbaric scenario, reasons Mr Attenborough. Blame doesn’t really comfort anyone. Blame can lead to unforgiveness and the highly emotionally toxic condition of bitterness. An unforgiving bitter, person, doesn’t solve anything or even find any lasting comfort in their blaming. Some of life’s difficulties can not be solved in this life-time, but the one who is afflicted with difficulties can always at least be comforted in this life-time. But not if all anybody does is blame. Blame doesn’t really help anyone. Our propensity to blame started with our first parents. When the Creator arrived in the Garden of Eden to walk with Adam and Eve in the cool of the day, Adam and Eve hid. When God confronted with Adam about why he had eaten from the forbidden tree, Adam's immediate response was to blame Eve. Eve in turn blamed the serpent, and the serpent didn't have a leg to stand on! When Job’s so-called comforters turned up to solve, comfort and help, all they did was blame. They blamed Job for his predicament. Surely he had sinned, they argued, or had been foolish or not given God His due honour? In all their blaming, Job was not comforted. Blame doesn’t really change anything. 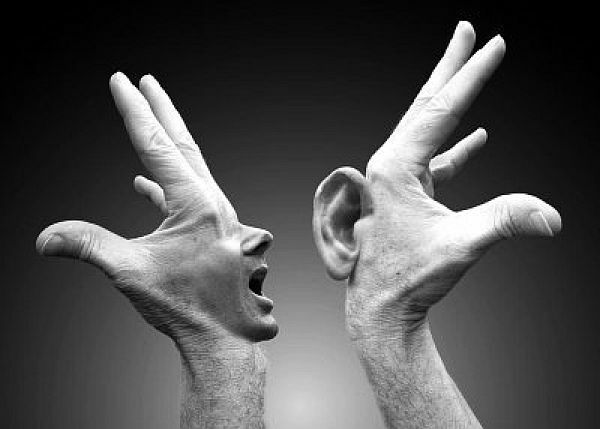 Harsh criticism may, at times, be warranted – but unless it is accompanied by aid nothing will change. A pastor may be criticised for a particular ministerial deficiency, but unless he is aided by the support of the same critic, there is very little likelihood that his deficiencies will be addressed and thus, nothing will change. When Christ’s disciples saw the man born blind, they asked who was to blame? Jesus Christ brings comfort, help, solutions, and change. Rather than blaming anyone, Christ solved, comforted, helped, and brought change to the situation. This is the difference that Christ can make in any difficult situation. God may be the One to blame in some people’s minds for what appears to be senseless suffering in this world, but this necessarily requires that He also exists. Thus, David Attenborough’s (and it is an objection repeated by Stephen Fry and Richard Dawkins) objection to God only works if there is a God to blame. I wonder if our ability to see any possible good from tragedy, suffering, misery, pain, has more to do with our very very finite knowledge of how the world works? Similarly, I wonder if God always has morally good reasons for having a world in which tragedy, suffering, misery, pain, happens. Someone has pointed out that in the absence of these adversities such positive virtues as compassion, mercy, forgiveness, long-suffering, patience, toil, could not be developed in those God is preparing in this life for the life-everlasting. The emptiness of Mr Attenborough’s misplaced blame. Loa loa filariasis is a skin and eye disease caused by the nematode worm Loa loa. Humans contract this disease through the bite of a deer fly or mango fly. Something that Mr Attenborough fails to mention is that this parasite doesn’t require a human eye for its survival (even though he asserts that it does) and that it can be hosted by a human or animal without detection or even symptoms for many years. He also fails to mention the many medical missionaries who have gone into these regions of Africa to comfort, heal, help, and change this situation on behalf of those who are afflicted with such parasites. The Loa Loa Filariasis Parasite is treatable with medication and in some incidences, surgery. The God whom David Attenborough, Stephen Fry, and Richard Dawkins blame for such injustices appears to be the same God who has raised up people of compassion, self-sacrificial love and dedication, to bring healing, hope and comfort to those afflicted. Organisations such as CBM (Christian Blind Mission) are tremendously effective in providing solutions for people in Africa and other parts of the world who are afflicted with curable blindness and other diseases. Of course, they aren’t the only organisation doing such work, World Vision, Compassion International, are also providing hope, help, and healing in Jesus’ Name to the poorest, most desperate people’s of the world. When Jesus told His disciples that this particular blind man was afflicted so that the works of God could be made manifest (John 9:3), He was stating a principle for dealing with any life-difficulty: rather than wasting your time looking for someone to blame, seek our Heavenly Father’s grace to minister hope, help, healing, solutions, and comfort to those who are afflicted. This means we get involved with the hurting, broken, damaged, lost, and confused individuals of our world and show them the love and holiness of God. And it also means that we care enough for our society to speak up about injustice and unrighteousness that can only lead to even further hurt, brokenness, damage, pain, and confusion. This is one reason why we take a stand for the sanctity of marriage as the only legitimate context for human sexuality. It’s time to stop blaming and time to start your healing. Blaming pours fuel on the fires of unforgiveness that simmer and flare-up in your soul. It’s time to let it go. It’s time to unclench your fist and open your palm toward Heaven. It’s time to change. It’s time to be healed. You may have been blaming God for how unfair your life has been, and secretly withdrawing from Him because you feel you can no longer truly trust Him with your life. Let it go. He is trustworthy. He knows what’s best for you. He loves you more than anybody else can or does. He offers you hope, help, healing, comfort, and solutions and it begins with you acknowledging your need for Him. “We must work the works of him who sent me while it is day; night is coming, when no one can work. As long as I am in the world, I am the light of the world.” Having said these things, he spit on the ground and made mud with the saliva. Then he anointed the man’s eyes with the mud and said to him, “Go, wash in the pool of Siloam” (which means Sent). So he went and washed and came back seeing. Life often presents us with circumstances where we feel like we are no longer in control. In these moments we tend to look for whatever we know we can control. This is why a husband will lash out at his somewhat compliant wife (and why some men would only marry a woman they knew they could intimidate). It is why a big sister, who is struggling to control her world in which her “friends” are so mean to her, will belittle her little sister at home. It’s why a boss who can’t control the economy will demean a junior employee in front of the other staff. And it’s why a boy who feels deprived of his father’s affirmation will become a bully in the schoolyard. Apart from these relational controls we have all found great comfort in at least controlling what we eat or drink. Thus, a teenage girl will stop eating - because at least she can control that. A too-long-single person, overwhelmed by loneliness, which they interpret as rejection, will eat to excess in an attempt to control something. For those who might identify with any of these examples I have two pieces of pastoral advice. Powerlessness is a horrible feeling.On the other hand the ‘power’ that comes from knowing what’s happening, what’s about to happen and how to make it happen, can be deeply fulfilling. We were designed to control - but only up to a point. It seems to me that Satan’s original temptation of Adam and Eve had a lot to do with an impossible promise that they could control more. The appalling tragedy of this temptation is not only how false it was, but how much less it was of what Adam and Eve already enjoyed! Satan was offering Adam and Eve the power to become “like God” - but Adam and Eve were already “like God” because the were created in the image of God! Before mankind fell into sin, God had given them control over their choices, control over their environment (Eden), control over their time, control over Satan, and control over the temptation to sin. Even after sin entered into the human race when Adam and Eve sinned, God told mankind that they had the power to resist temptation and choose not to sin. But there were some things that mankind was never designed to control - even in the perfect world prior to mankind sinning - apart from the weather, it also included other people (with the exception of parents exercising ‘control’ over their infant children). In a world filled with people corrupted by sin, there is now much we cannot control which is painfully highlighted every time there is a terrorist attack. To some extent, we also have limited control over our health - especially considering injuries inflicted upon us by others and illnesses due to industrial negligence. There will be times in life when we will not know what to do in the midst of these relationship tensions. This is when we may not know what the best thing to do is - but we should at least know what the better thing to do is by determining what would make things worse. 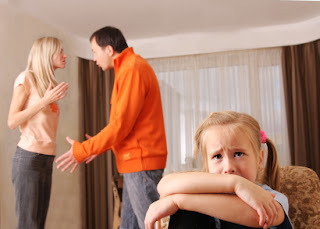 A husband loses his cool at his wife one time too many and now his wife won’t talk to him. He may not know what the best thing to do is, but using the better-worse principle he should know what would make the situation worse (such as, continue to lose his cool at his wife, or, refuse to apologise to his wife). This is my first piece of pastoral advice. ¶ If any of you lacks wisdom, let him ask God, who gives generously to all without reproach, and it will be given him. God is seated upon The Throne. He’s not on the edge of His throne. He’s not standing up from His throne. He’s seated on His throne. He reigns! This is why we declare that God is in control! Another way of saying this involves the word: sovereignty. A Sovereign is ‘a supreme ruler’ such as a monarch or emperor. Thus, when we talk about the ‘sovereignty of God’ we mean that God is ultimately in control. Just as any monarch does not ‘control’ every decision and action of their subjects, so the Lord doesn’t ‘control’ our every decision, choice, or action. Yet, and here is where the comparison with an earthly sovereign breaks down, the Lord is still able to direct, lead, guide, influence, or intervene in every decision, choice, or action of people and the rest of creation. Acknowledging this calls for trust from His subjects. Whether we are experiencing comfort, ease, plenty, or illness, distress, and lack - we know assuredly that our Lord is in control, and that He is always good! This kind of trust in God leads to contentment and peace. It’s easy to write about, preach, and teach, but trusting God in the midst of illness, distress, and lack is a little more difficult. I faced this six months ago when I collapsed with a severe jolt of nerve pain down my spine and was unable to walk for 5 days. After a CT scan my doctor told me to brace myself for a bleak diagnosis and booked me in to see a specialist. During this time I was confronted with the real possibility of living with severely restricted movement for the rest of my life - or worse. Although I didn’t understand what was happening at the time and I certainly didn’t know what my future held, I had by this stage of my Christian walk grown to trust God despite my circumstances. As I was to discover, much of my now degradative spine was the result of a motorcycle accident I endured some twenty-five years earlier (which at the time saw me immobile for two months). My confidence in God’s goodness despite my adversities is grounded in Scripture and experience. And this leads me to my second and closing piece of pastor advice when life is not better, but is worse: despite how you feel or what you’re going through, worship God and resist the temptation to withdraw from regular worship. We are designed and created for relationships and to worship God. In both of these we find our deepest joy and fulfilment - even in times of worse. I have just seen Batman Versus Superman and I left the theatre a little stunned. After seeing all the internet noise about how bad this movie was, I was stunned that it was so good! But I was more stunned by the deep profundity that the movie explored and the spectacular job it did in introducing viewers to one of the most important questions any human being can ask: Who and what is “God”? Could Batman V Superman be the greatest Christian Apologetic Supposal since The Chronicles of Narnia? I can understand why so many reviewers have given this movie such negative feedback. It’s not light. In fact, it’s heavy. Most movie consumers want to be amused rather than provoked to muse. But I’m not like most movie consumers. I rarely watch a movie just once and I often watch a movie at least three times. When the Jewish creators of Superman, Jeremiah Siegel and Joseph Shuster, invested into their original comic-book character the long held hopes that many Jewish people believed the Messiah would possess, they inadvertently created a very Christ-like figure. You will travel far, my little Kal-El. But we will never leave you... even in the face of our death. The richness of our lives shall be yours. All that I have, all that I've learned, everything I feel... all this, and more, I... I bequeath you, my son. You will carry me inside you, all the days of your life. You will make my strength your own, and see my life through your eyes, as your life will be seen through mine. The son becomes the father, and the father the son. This is all I... all I can send you, Kal-El…They can be a great people, Kal-El, they wish to be. They only lack the light to show the way. For this reason above all, their capacity for good, I have sent them you... my only son. From the outset of Batman Versus Superman, the theme is made abundantly clear (and perhaps this is why so many reviewers have disliked the movie?). Who and what is God? After all, Kal-El (which in Hebrew roughly translates to Voice of God with “El” meaning ‘God’) possesses many godlike qualities. 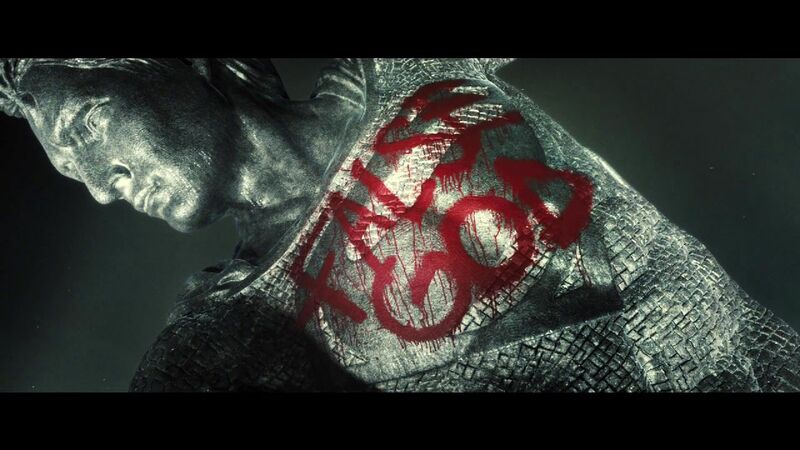 Does the existence of Superman prove or disprove God? the movie asks. The are numerous glimpses of TV talkshows where this question is shown to be all abuzz around the world. Neil DeGrasse Tyson, an astrophysicist and host of the Startalk radio show, is interviewed discussing his reasons why the existence of Superman proves Darwinian Evolution and that there is no God. Putting aside that none of DeGrasse Tyson’s comments are actually scientific (since he is dabbling in Philosophical speculation) the fact that a scientist is stating that this proves there can not be a God sounds like scientific fact. DeGrasse Tyson’s comments reminded me of the quip, Only that which can be proven mathematically or scientifically can be considered true fails its own standard of truthfulness (since that statement is neither mathematical or scientific!). Perhaps Zack Snyder, the Director of the movie, wanted his audience to realise this. The world is turning against the once beloved Superman. There is a Senate Enquiry being conducted into Superman’s role and lack of accountability. The media are beginning to question Superman’s morality especially after he took on General Zod and in the process hundreds of innocent lives in the twin cities of Metropolis and Gotham died collaterally. Questions are being asked, like: Why does only rescue some? And add into this cauldron the contribution of someone whose name sounds remarkably like Lucifer - Lex Luther - and we end up with an uncanny Christ-like scenario where the once adoring crowds of Jesus suddenly turned and screamed for His execution. Batman is presented as a very Apostle-Paul-like character. He misunderstands Kal-El and is bewildered by those who support him. He sets out to destroy him in much the same way that Saul of Tarsus set out to destroy the Christ of Christians. Just as the Apostle Paul came to realise who Jesus really was, so does Bruce Wayne. In fact, he realises that they have much in common. But in the meantime, Batman must employ forces beyond this world to reduce Superman to the status of a mere mortal human being. Just when victory was within his grasp, his eyes are opened (in the movie, in a highly symbolic fashion, his eyes literally are uncovered) and he sees Superman as the answer not the problem. ¶ Now Jesus loved Martha and her sister and Lazarus. Martha Kent is shown throughout the movie as a very devout woman who prominently wears a Christian Cross around her neck. She becomes pivotal to the plot of this movie. This is the point in the movie when we realise that both Bruce Wayne and Clark Kent were both orphans. While Bruce Wayne grew up bitter and vengeful after the murder of his mother, Martha, Clark Kent enjoyed a fostered childhood being raised by Jonathan and Martha Kent. 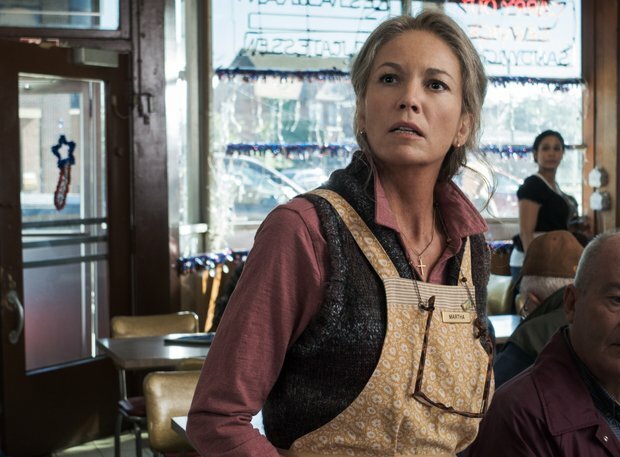 Just as with the Biblical Martha, who was always busy preparing and serving meals (Luke 12:40) we meet Martha Kent in this movie busy serving in a café. Lex Luthor: See, what we call ‘God’ depends upon our tribe, Clark, Joe, 'cause God is tribal; God takes sides! No man in the sky intervened when I was a boy to deliver me from daddy's fist and abominations. I figured out way back if God is all-powerful, He cannot be all good. And if He is all good, then He cannot be all-powerful. And neither can you be. Meanwhile, Lex Luthor has employed some of the derelict Krypton Spacecraft technology to clone/reconstruct General Zod into the arch-enemy of Superman. This monstrous creature was seeded by Lex Luther’s own blood and is determined to destroy Superman. Lex Luthor: If man won't kill God, the Devil will do it! He is ten times everything Superman is - except in virtue and the pursuit of justice. The movie culminates with this monster delivering Superman a very Christ-like end which simultaneously marks its own end. As the lifeless body of Superman is lowered down from the Golgotha-like mound (with two Christian crosses in the top left of the rubble), the cape of Kal-El becomes a shroud as his now beloved disciple, Batman, and the woman he loved, Lois, attend to him. Bruce Wayne: You don't know me, but I've known a few women like you. Diana Prince: Oh, I don't think you've ever known a woman like me. It is at this point that we have been introduced to an angelic creature who has taken on human form, Diana Prince. She uses “invisible” weaponry and seemingly has just as much power as Superman. By this stage, we have already learned that she has been interacting with humans for centuries and at one point could read Bruce Wayne’s mind. ¶ Then the devil left him, and behold, angels came and were ministering to him. C.S. Lewis coined the term, A Supposal, to describe his Chronicles of Narnia. Suppose, he reasoned, if God had created another world where there were talking animals, real-life mythical creatures, and humans. How would appear to them. He supposed the answer to this as the Chronicles of Narnia. While not every detail in the Narnia saga perfectly and tidily parallels the Gospel, it’s remarkable just how much of it beautifully illustrates Gospel truths. 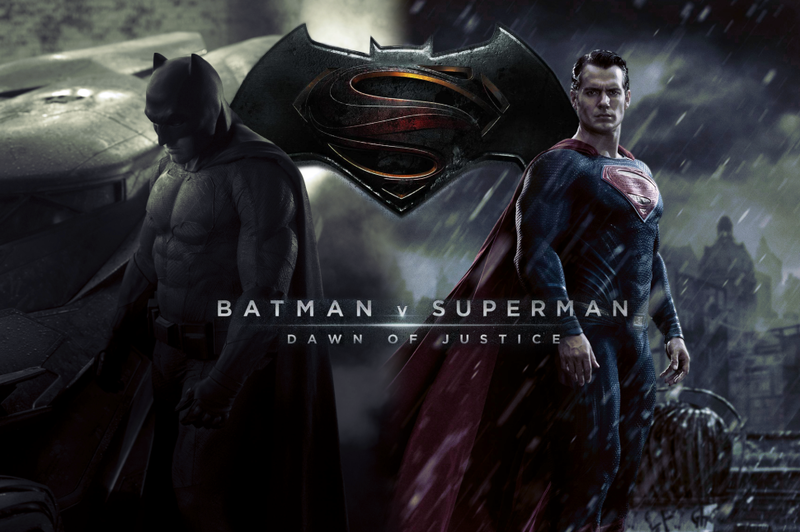 I suppose the Batman Vs Superman story is similar. It certainly doesn’t perfectly parallel the Gospel, but it too is remarkable just how much of it is a dramatic illustration of the Gospel that also addresses how we understand the key claims of the Sacred Script. This is perhaps not surprising since any good story is usually just a shadow of The Story of how God made the world, mankind rebelled, God made a way of salvation by sending His Son as our Saviour, and how this mission of eternal justice is now administered by His servants who must likewise step up and become heroes. Of the many interactions that The Christ had with people, He had two particularly extremely curious conversations with his chief apostle, Peter. Curious may not be the right word. Bewildering may be more apt. One of them required Peter to act, the other required Peter to answer. My suspicion is that these two poignant conversations give us insight into the two greatest struggles anyone desiring a deeper spiritual life will have to face. Having changed his name from “A reed that bends in the slightest breeze” to “Strong and solid as a rock”, Jesus reverts to Peter’s birth-name in addressing him now. “Simon, Simon” He says. It seems that Jesus was reminding Peter of who he was - one easily influenced by others. The world loves to sway people away from following God. Sometimes Satan orchestrates this. A young man gives his life to Christ and becomes a real threat to the powers of Darkness. Satan begins scheming. ¶ “And when you fast, do not look gloomy like the hypocrites, for they disfigure their faces that their fasting may be seen by others. Truly, I say to you, they have received their reward. Most of us, left to our own devices, are reeds that bend in the slightest breeze. We want to be “in”. We want others to accept us. We want the approval and affirmation of the crowd. This will cause a child of God to succumb to the devilish temptations that the world offers if they lose their vision of their Saviour. But I have slightly rushed ahead to the second curious conversation that Jesus had with Peter. “Idou” is the Greek word that Jesus uses to begin His address to Simon. Pay attention to what I am about to tell you is the sense of the Greek word idou. It carries a sense of gravitas (stern importance). Imagine Jesus taking you aside from the crowd, putting His hand on your shoulder and looking you square in the eyes and saying, “My little lamb, you are so easily swayed by the world. Pay attention to what I am about to tell you!” Can you hear the tone in Christ’s voice? Can you feel the weight of this moment? Idou. Behold. Listen very carefully. Following Christ is no trivial, frivolous exercise. While our salvation is won for us at the Cross our journey with Christ does not stop at the Cross. Our journey has twists and turns, mountains and valleys, crowds and isolation, plenty and want, moments of urgency and moments of rest. But idou, we have an Enemy lurking! “Simon, Simon, behold: Satan has demanded to have you!” In a scene reminiscent of the Book of Job where the God of Glory had Satan make a similar demand for the soul of Job, the Son of God had Satan demand the soul of Peter. Like Father like Son, Jesus was stunningly confident that Peter would remain loyal to Him despite Satan’s best efforts to lure him away. At this point in the Gospel account of this sombre episode I expect the next statement from Christ to be something like, “But I have rejected his request! But it stuns me that it isn’t. Jesus granted Satan’s request! Many a young man has been introduced to Jesus in their youth then had Satan lure them away before they could idou the Christ. The world has its pleasures, delights, and attractions. But these pleasures are fleeting, these delights are dangerous, and attractions are often traps. “Simon, Simon, behold: Satan has demanded to have you, that he might sift you like wheat!” Sifting wheat involves shaking, wind, and fire. The sift allow the wheat to pass through and the chaff, the husks, and the debris to be removed. 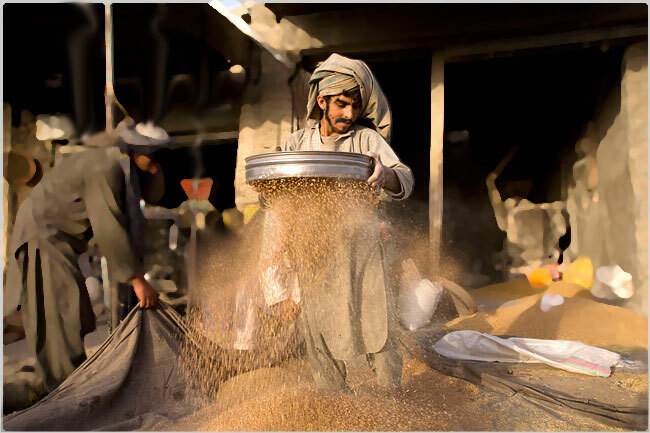 The weightier wheat drops down while the lighter chaff is blown into the fire. What does it take for Satan to lure a child of God away from their Redeemer? A relationship? A drink? A pill? A bed? Chocolate? A football game? After announcing to Peter that he was to be sifted by Satan - with Christ’s permission - Jesus assures Peter that his impending failure will not be his final doom. “But I have prayed for you” Jesus tells him. It seems that even the Son of God thinks prayer does something eternally significant and immediately helpful. Jesus prayed for Peter. For facing Satanic sifting, Jesus prayed for Peter. Satan will attack, but Jesus is praying. But nearly always changing everything. Given the choice between having Jesus guarding us against Satanic attacks and having Jesus pray for us while we go through them, how many of us would choose the prayer option? 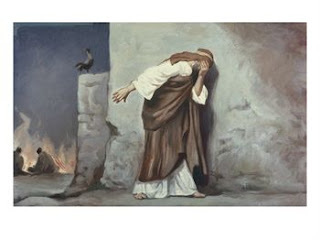 But what Jesus prayed for Peter is even more curious: “but I have prayed for you that your faith may not fail.” Even after three years of spending everyday with Jesus, Peter still needed the Son of God to pray for him to keep believing, keep trusting, and keep being confident in what he had come to know as the truth. If the Apostle Peter could have his faith in Christ rocked, so could we. If he needed assistance to keep believing the truth, so do we. Prayer, daily Bible reading, and Church attendance are each ordained by the God of All Glory for His children to grow and thereby be able to withstand the onslaught of our Enemy. For us today who do not have the privilege of walking each day around the shores of Galilee with the incarnate Christ, we have to inform our souls of the truth by acquainting ourselves with the Word Made Flesh in the Word made of words, the Bible. It is in times of Enemy sifting that we need to be reminded of the truth from God’s Word so that we can stand firm. Jesus went on to describe Peter’s failure during this coming time of sifting. As a result of Satan’s sifting of Peter, the chief apostle would publicly deny, three times, even knowing Jesus. But this would not be the end of this sad episode. There was hope for the fallen apostle - “And when you have turned again, strengthen your brothers!” There is hope for us too. This charge to Peter about strengthening his brothers was repeated by Christ in the other very curious exchange he and Jesus had after the resurrection of Christ. Perhaps in a one-for-one correspondence to Peter’s denial of knowing Jesus, the Son of God asked him three times do you love Me? It really is the question. Do you love Me? I’ve met people who love Jesus. They are different from most people. Even though they suffer at times, they remain exceptionally positive - because they love Jesus. Despite struggling with their church fellowship from time to time, they would never walk away from it - because they love Jesus. In face of Satanic sifting they are able to stand firm, because they love Jesus. And because they love Jesus they have dedicated their lives to serving and strengthening their brothers while doing what they can to feed the lambs of Christ. Jesus could have asked a far lesser question like Will you serve Me? or Will you obey Me? or Will you dedicate your life to being a pastor of My sheep? Will you read your Bible everyday? Will you be faithful each Sunday in attending church? But He asked the question that has eternal and therefore immediate consequences, Do you love Me? And well He might us: Do you love Me? Three times. “My reed-like-easily-swayed-by-the breeze-of-other people’s-opinions Chief Apostle, do you agapas (pronounced as: argarpars , ἀγαπᾷς) Me?” ’Aγαπᾷς is translated into English as love - because we don’t have a word in English that truly captures this beautiful Greek word. The best we could do in English is to use several words such as, self-sacrificing, utterly-heartfelt and dedicated, the highest commitment and affection for, (12 words) to translate this word into English. But each of the three times that Peter was asked by the Son of God about whether he loved his Lord, he did not answer Christ’s question. Instead, Peter replied, “Lord, you know that I really like you a lot.” Instead of agapas, Peter used the word, philoh (φιλῶ). I wonder how many people today, who identify as followers of Christ, would answer like the recently-sifted Peter if they too were asked how they feel about Jesus? It is my mission as a pastor to help those entrusted to my care to love, in an agapas type of love, the One Who Is Love. 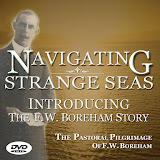 It is my greatest burden to achieve this pastoral mission. But it is my saddest confession that it is my greatest deficiency as a pastor. To this end, I would value your prayers - especially after learning what we have just learned about prayer from Luke 22:32. And in the meantime, I too will apply Luke 22:32 and pray for you to love Jesus, withstand the sifting of Satan, and to strengthen your brethren.